Two, Three and Four Position Swing Bays available. The price includes everything you see in the picture. 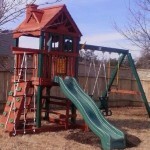 Concrete, rope, metal swing ductile (hangers), heavy duty lags and bolts, 3 swings, pickup, delivery, and installation. 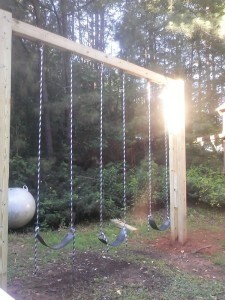 Chains for the swings and staining of the swing beam can be acquired for additional cost. 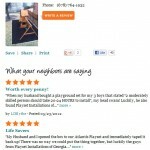 This swing bay is perfect for homes or businesses. Churches, daycares, subdivisions, parks, etc…….feel free to email, call, or text with questions or to be scheduled. Contact US for more information or to get a Quote! Don’t forget to ask about our discount for special needs kids and or facilities.